With just a week to go before the Geneva Motor Show Pininfarina has finally unwrapped its Sintesi concept car project which promises to be one of the most interesting and innovative exhibits to be presented at the Swiss show, and continues a long tradition by the Tuinese firm of using Geneva as a showcase to unveil exciting new projects. Today's latest instalment in the 'magazine' teaser format that Pininfarina has used to steady reveal background information about the Sintesi project offers a first comprehensive look at its futuristic styling as well as presenting a cutaway diagram which takes a look beneath its form. 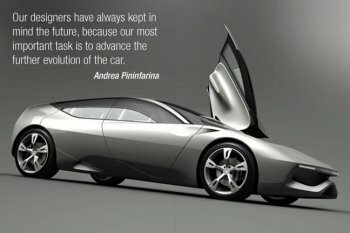 Pininfarina say that "we should be looking at Sintesi with our minds open to the future". And the images reveal a four-seater car that owes much of its form to its alternative propulsion system and a design that has been led by the wholly different packaging requirements demanded by such an arrangement compared to that associated with the conventional internal combustion engine, "technologies that allow to shape the car around its occupants and to interact with its surroundings," say Pininfarina in the slide presentation. Earlier in the series of slides Pininfarina detailed how the alternative powertrain could be neatly packaged around the primary needs of the occupants, as well as how the car could incorporate futuristic communications methods, including the infotelematic ClanCast system that would allow it to absorb traffic sign messages and other external information as well as giving it the ability to smoothly interacting with other cars on the same road. 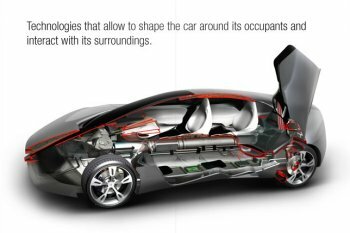 The result is car with a body style form that has been less compromised by traditional boundaries, and which is effortlessly stylish and forward looking. Aggressive looking yet with sweeping styling, and finishing in an attention-grabbing signature 'coda tronca' tail, this concept will see Pininfarina in Geneva once again at the forefront of design advances. Large front and side windows sections and scooped air intakes along with big, chunky alloy wheels shod with low profile tyres complete the sporty image exuded by Sintesi. Sintesi builds on show-stopping theme portrayed by the Maserati Birdcage 75th show car unveiled in Geneva three years ago, a concept which featured dramatic carbon-fibre bodywork as well as a long and flowing Perspex screen. 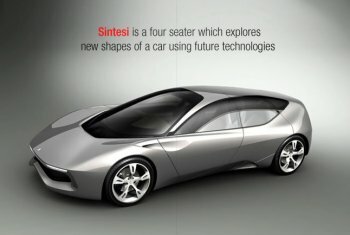 Sintesi is seen by Pininfarina as being a realistic look at the future of automobiles, bursting with innovative ideas to be incorporated in the generations to come, and a path that the Italian design and engineering house intends to explore further. "Pininfarina concept cars have always been part of a logically developed process," says Pininfarina. 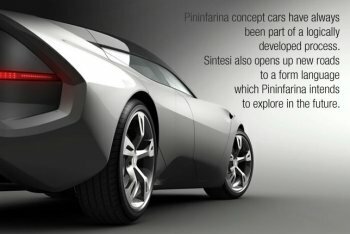 Sintesi also opens up new roads to a form language which Pininfarina intends to explore in the future." Pininfarina has also outlined the partners involved in the project: Nuvera Fuel Cells, Osram, Materialise, Pi Shurlok and Reicom. US-Italian company Nuvera is at the forefront of alternative power source technology advances, developing hydrogen and natural gas fuel cell power systems, fuel processors and fuel cells stacks, and it has collaborated with Centro Ricerche Fiat in the development of the Panda Hydrogen project. Reicom supply Sintesi with the ClanClast broadband infotelematic system, while other partners' areas are PI Shurlok (electronic systems), Materialise (software) and Osram, which has developed the car's unique very narrow front and rear light clusters. The slide presentation closes with a quote from Pininfarina Chief Executive Officer since 2001, Andrea Pininfarina: "Our designers have always kept in mind the future, because our most important task is to advance further the evolution of the car."